So here’s a hypothetical problem for you – say you invent an amazing device that can predict to the nearest second when a person will next stub their toe. No-one else has ever made anything so accurate and it will potentially save everyone literally minutes of mild discomfort and swearing. But the problem is that to do it you need to strap people into a machine that has to simultaneously take 100 different measurements and makes an ominous RRRRRRRFZT noise. 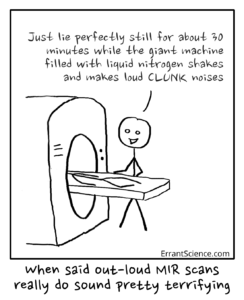 This giant machine is the cobbled together outcome of lots of little toe prediction devices all needing separate conditions and outputs. While it’s pretty horrific – especially test 67 – it does at least tell you lots of things all at once. Developing a new machine specific to your device is going to be expensive and because it will be specific to you and your device, people might still be forced to go in the big machine. For example, they want to have a test done on your competitor’s device (that tells them what colour socks they’ll be wearing when they stub their toe) at the same time. So you have three choices: add your device to the 100 tests on the giant horrible machine and accept that it won’t sell well; design your own machine which increases the amount of tests people need which will make people less keen to use it which means it won’t sell well; or at great cost build an entirely new, massive, but less horrendous machine that all your competitors might support or might ignore and stick with the old method. Without some kind of new machine technology, vitally important ‘toe stubbing’ prediction systems will stagnate and the public at large will be worse off. Well this is almost exactly the same problem that a company I spoke to last week had. They have a fancy new breath sensing device (it senses cancer with breath – not just breath, I think we already have things for that) which they want clinics to start using but there is no really accepted breath sampling machine to run their device on. So their system would either have to plug into some cobbled together home-brew breath collection system or design their own system to work alongside existing products at quite probably great expense. So their solution to this was not to sit on their hands and hope really hard (a common problem solving technique) but to go open source. They are going to develop their own generic breath collection system that everyone can use – even their competitors. To do this this are opening up the code and the design of the system to the public to help with and collaborate. Eventually the final product will be the result of a larger collaboration that they themselves will benefit from, but also anyone else working on similar devices will gain something too. Currently, the project is still in its early stages and you can see some of the design specs on their google drive and their software on GitHub. Hopefully once it develops, they’ll add some more details on the materials and physical design of the system which is not currently available. Now Owlstone aren’t unique. Other companies have done a similar thing. Ultimaker for example, have made their 3D printer open source. In doing this they get tons of free community and professional support by people adding to and improving their design. This project is much further developed and you can download the source code for the software, the bill of materials and even a very well made how-to guide about assembling it. A guide I have used several times when I’ve managed to break my printer and don’t want to have to ring the support line and admit I did something really stupid. Sure other people can steal some of the design ideas for their 3D printer but Ultimaker are banking on this improving the overall quality of printers and increasing the market for them. 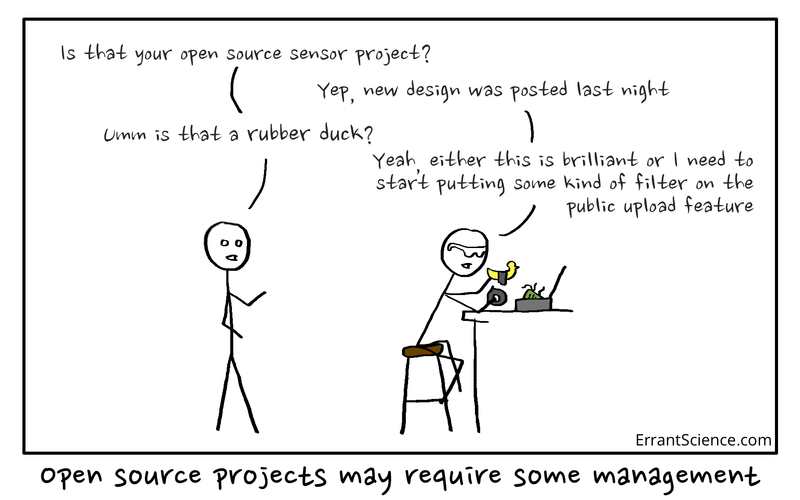 This is also a pretty timely blog article as open source research is slowly hitting the big time with people like the founder of BuzzFeed launching a new lab specifically for open source projects. Hopefully ones that don’t involve developing some kind of sentient click bait generating machine. I really hope that more companies launch open source projects alongside their existing closed portfolio. I’m not naive enough to wish the whole world was open source but I am hopeful that more companies realise that sometimes working on things that you don’t have complete control/monopoly over is actually good for business.